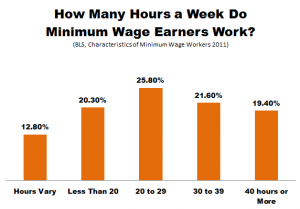 You are here: Home › Employment › Will Increasing the Minimum Wage Hurt Workers? I firmly believe in capitalism and that supply and demand dictate prices for all categories of an economy. Many years ago I worked at KFC, first as a drive thu worker, then as a cook. I worked there for three years total. I started making $5.50 an hour and I think I was at $6.80 when I left. There were two major advantages to this job than to other jobs. First, I got the job immediately at the start of my job search. I put in an application on Friday and had a job on Monday. The second advantage was that they would work with my school schedule. Every semester I planned out my classes and was able to work generally between 30 and 40 hours a week while attending school. 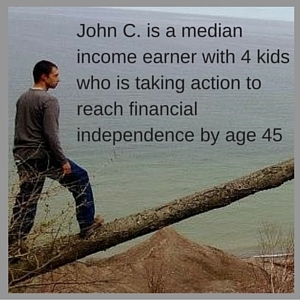 When I started I lived at home with my parents, so the vast majority of my wages I could save. I had worked there for about a year, when my future wife and I moved in with each other. She had a son who was almost 2 and we were both working at KFC, making the same low wage. We paid our rent, bought groceries, paid our bills and had very little left over. For a while both my wife and I worked two jobs, and we tried to work opposite schedules to avoid having to pay for child care. It was hard, but we could get by on a shoestring. The majority of the people I worked with moved on to better jobs. 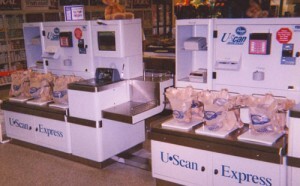 Some became management in the store, and others left to other industries or to better jobs in the same industry. The average person stayed for around 3 months. In a two year period I trained over 20 cooks, including a former pro boxer. Having this job history helped me find another job, and helped my wife find another, better paying job. For all the time I worked there we always had a steady stream of applicants. When the supply of people willing to work for $7 an hour is high, the wage will remain steady, If no one applies, then wages will have to rise to attract applicants. In our current economy I would wager there are many people willing to work these jobs for $7.40 an hr. I wasn’t involved in the numbers too much , but I remember that the goal of the store was to keep payroll under 20%, above that the store was loosing money, because the margins are relatively thin. Although the wages are low, some fast food restaurants pay an amazing 401K match. 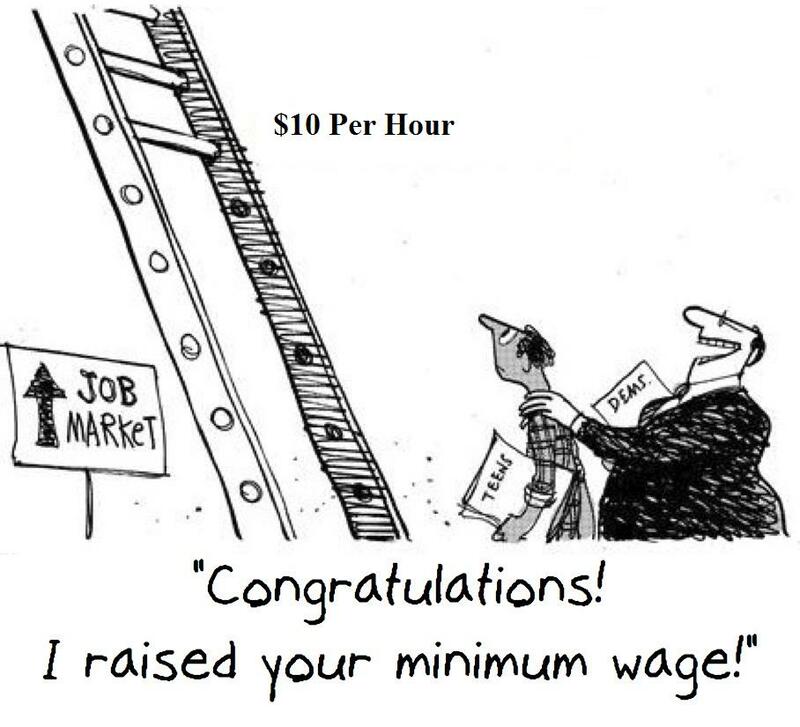 Would it be nice to be able to make $10 or $15 for an unskilled position? Absolutely. But it isn’t rational or sustainable. If the market would allow for it (meaning that there aren’t enough unskilled people to fill the jobs at wages below $15, and that people are willing to pay $10 for a whopper) then it would work. I watched the “documentary” made by Morgan Spurlock about being a minimum wage worker in America and how hard it is. The amazing fallacy shown in this movie was that they both got minimum wage jobs immediately, but chose during the experiment not to look for better employment. The experiment also had them showing up to a town with no money, no family and friends in the area, and no job history. And here’s a question, what about someone whose labor is only worth $7 an hour and the minimum wage law requires me to pay him $10 an hour? He will likely lose his job and be replaced with someone who can produce more, or with a machine, that now makes sense to use instead. 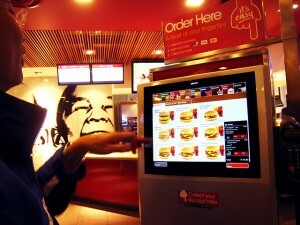 This is already happening in the fast food world, new order taking machines are becoming more commonplace. Increasing the minimum wage also has a negative effect on employees who have already been employed by the company for some time. If the employer only has a certain amount of money to spend on labor, and has to automatically pay more to every new hire, the experienced workers are likely to see stagnant or slowing wage growth. Effectively the raises they would have been able to earn aren’t available because the employer had to already spend the money on new hires. I ran into this during my KFC days when minimum wage was increased. Our employer gave out 10 cent raises every 6 months for experienced workers, but these raises stopped once the last minimum wage hike came into effect. I know 10 cents isn’t a lot, but it works out to a few hundred bucks a year, which is very helpful, especially when already working for a low wage. I understand how difficult it is for someone to live off of minimum wage, but that’s just it, the jobs are not designed for people to live off of in a long term manner, or to support a family on. They are entry level jobs, that give people the ability to learn basic skills. The real solution isn’t to distort the economy to provide artificially high wages for unskilled work, but to focus more on providing better education and job training in this country to help people become more than minimum wage workers. At the same time an improved economic landscape makes the minimum wage void. In North Dakota McDonalds workers are earning $15 an hour and get a $300 sign on bonus. The same people who are fighting for the minimum wage increase are the same people who brought us Obamacare, So the guy who just got his hours cut from 40 hours to 25 hours (due to Obamacare) is about to lose his job, all because these government officials wanted to “help” him. It’s hard to make ends meet earning $1300 a month (full time minimum wage). It’s impossible making $800 a month (25 hours a week) and you’re dependent on the state completely at the new 0 hours a week. 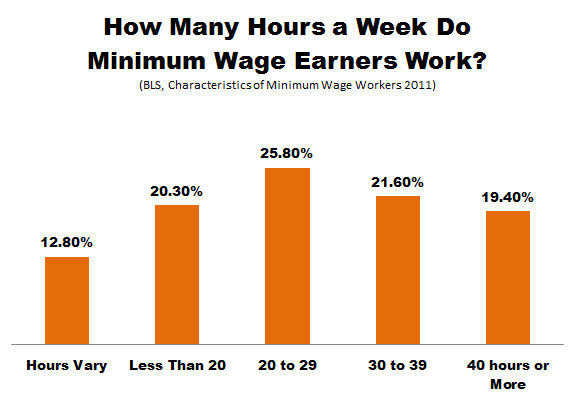 Look at the chart below to see how many hours minimum wage earners work. Look for a major shift after 2014. 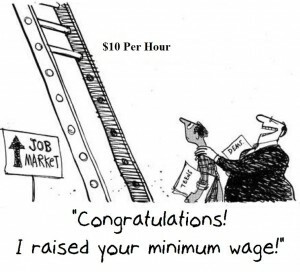 What do you think about increasing the minimum wage? Is it necessary to do so to keep up with inflation? Or for “social justice”? What other solutions can we find to help low wage earners increase their earnings other than through legislation? 2 Responses to "Will Increasing the Minimum Wage Hurt Workers?" As a self-employed person, the job market doesn’t really affect me. Here in New Zealand minimum wage is around $13.50 per hour, which might sound like a lot, but then consider to rent a room in a house here is somewhere between $150-200 per week. Factor in tax, groceries, transport etc and you’re barely moving forward at all. I understand that unskilled jobs are exactly that; unskilled, but I think there needs to be a living wage. I would rather live somewhere like Norway where I knew that a bus driver, someone working in a fast food joint and a cleaner were all earning enough that they didn’t need to juggle multiple jobs and were moving forward with their life goals. Thank you for joining the discussion Christine! If the output of value for a job doesn’t produce an amount equal to the “living wage” required by a law then what happens? Does the company operate at a loss forever? Does the government subside the wage difference? Or does the business model cease to exist? What is a “living wage” for one person might not be for others. I was able to live and pay bills and get by earning $6.50 an hr, some people feel $15 an hour is necessary to live off of, others may say $25, who gets to decide? In a way our system in America to some extent subsidies low wages through the tax system. We have the Earned Income Credit which is based off of a persons earned income tax filing status and number of children, with amounts ranging up to $6,044 for the year. For example a Head of Household single parent of 2 earning $7.50 per hour for a 40hr work week would receive a credit of $5,372, essentially increasing her hourly wage to $10.18. Add in the child tax credit of $1,000 per child and her wage increases to $11.18.